In the final fortnight of 2014 Twitter was dominated and defined by a single hashtag - #Illridewithyou. As a crazed fanatical gunman held people hostage in a Sydney café, thousands of Australians tweeted their support for Muslims afraid of an Islamaphobic backlash. "I'll ride with you" began as an offer of practical kindness and solidarity - literally to travel with Muslims on public transport, to dispel fear and help avert unpleasant scenes - but rapidly became a powerful message of shared humanity and defiance of terrorism, bigotry and hatred. And now, tragically, the first fortnight of 2015 looks set to be defined by another hashtag, also a response to fanatical Islamic gunmen - #JeSuisCharlie. Along with respectful silences and pencils defiantly held aloft, #JeSuisCharlie expresses both sadness and solidarity, and the grim reality that even if we are not high-profile journalists, any of us could, like the murdered police officers, simply be in the wrong place at the wrong time. The rights and wrongs of Charlie Hebdo's cartoons will doubtless be picked over for years to come. There is always an ongoing debate to be had about religious pluralism and secular society, about true tolerance, real respect and freedom of speech and expression, but to be constructive that debate can never be conducted in a climate of fear or be tainted by reactive intolerance. As the British Council of Muslims said in their statement condemning the attack: The best defence against closed minds is for a truly open society, welcoming of all. 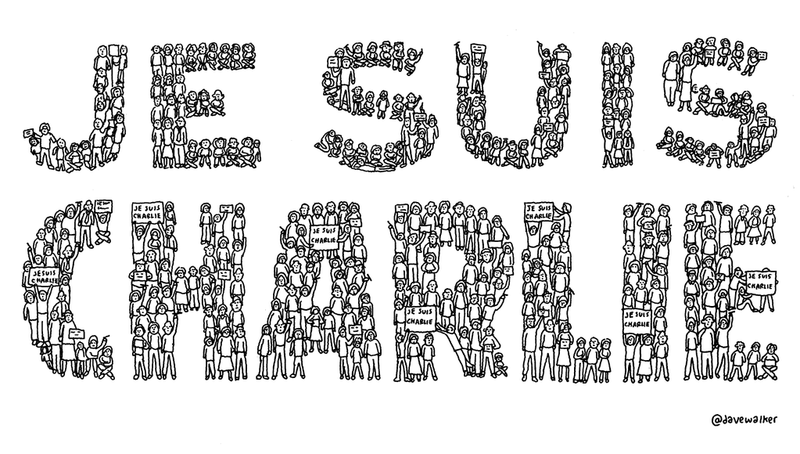 #JeSuisCharlie yes, definitely, but let's not forget the solidarity and kindness underlying #Illridewithyou. That powerful, global wave of support and humanity should not be consigned to last year - we need it now, more than ever. For good people to overcome evil we all need to stand together, and ride together, day in and day out.